Confused by Nautical Phrases and Boating Terms? You're Probably Not Alone! Are you confused by nautical phrases? Do they leave you 'all at sea'? Forestay ~ The foremost part of the standing rigging, which supports the mast and prevents it from falling aft. Forward ~ The area towards the bow of a boat. Foul ~ To obstruct or tangle in some way, as in ‘the anchor is fouled’. Fractional Rig ~ Where the forestay is attached some way down from the top of the mast. Frap ~ To tie two or more lines together. Freeboard ~ The vertical distance from the waterline to the deck. Furl ~To furl a sail is to roll it up. Note that 'furling gears' are not necessarily 'reefing gears'. Gaff ~ A small spar on which fore and aft sails are rigged, hence ‘gaff rigged’ as opposed to ‘Bermuda rigged’. The vessel shown here is a gaff cutter, and she's flying a topsail. See also 'gunter rig' below. Gale ~ A wind of Force 8 or 9 (severe gale) on the Beaufort Scale. Next up is Force 10 (storm). Galley ~ The ‘kitchen’ in a boat. Best sited near the companionway, although some sailboat designs have pushed them further forward into the accommodation. Gamming ~ The act of yarning done by sailors with other sailors. Telling stories with a slight exageration. Genoa ~ A forestay-mounted headsail large enough to overlap the mast. GMDSS ~ An Acronym for the ‘Global Marine Distress & Safety System’. Ghosting ~ A nautical phrase meaning to sail in little or no wind. Go About ~ Another nautical phrase meaning to tack, or change direction across the wind. Gooseneck ~ A metal fitting which secures the boom to the mast which allows the boom to articulate horizontally and vertically. Goose Winged ~ Sailing downwind with the foresail on one side of the boat and the mainsail on the other. 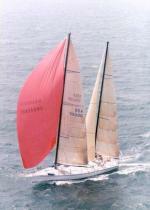 Usually the headsail is poled out as shown here. It's a popular technique with cruising sailors who may not wish to use a spinnaker, as 'goose-winging' presents a good spread of sail to the wind. Ground Swell ~ A broad swell of the sea, often caused by a distant storm or other weather disturbance. Guard Rail ~ A metal rail fitted around the edge of the deck to help prevent crew from falling overboard. Guard Wires ~ Performs the same function as a rail, but uses wires supported on stanchions. Gunkholing ~ A form of coastal cruising in relatively shallow waters, exploring creeks and estuaries. Deep-draft fin-keelers are clearly not best suited for this. Gunter Rig ~ A type of gaff rig where the gaff is held almost vertically and effectively forms a extension to the mast, enabling the gunter rig to carry the same size triangular sail as would a Bermudan rigged sail boat. The gunter rig is often seen on trailerable sailboats as it allows all spars to be shipped inside the boat. The version shown here (on a Drascombe Lugger) also sports a diagonal batten to add more sail area and support the leech. Gunwhale ~ Pronounced ‘gunnel’. See bulwark. Guy ~ A steadying line for a spar, particularly a spinnaker pole. Gybe ~ When sailing downwind, to alter course so the sails set on the other side of the boat. Also spelled 'jibe'. GZ Curve ~ Calculated data to enable yacht designers to predict the static stability of their creations. The greater the area above the line, the higher the boat's stability and vice versa. Halyard ~ The rope used to raise and lower a sail. Hanks ~ Fittings sewn onto sail luffs for attaching to stays. Hatch ~ An opening in the deck giving access to the boat's interior. Hawse Pipe ~ A metal pipe in the foredeck through which the anchor chain passes to the locker below. Head ~ (1) A triangular sail's uppermost corner. (2) The universal name for a sea toilet. Headway ~ The forward movement of a boat through the water. Head Foil ~ An alloy extrusion fitted around the forestay containing a groove (sometimes two) into which the luff of a headsail slides. Essential for roller furling headsails. Head-to-Wind ~ A nautical phrase indicating that the bows are pointing directly into the wind. Heading ~ The direction in which a boat is moving. Heel ~ The attitude of a boat when it leans over and travels on one side, as reacts to either the force of the wind or a shift of weight aboard. Heave-to ~ To keep a boat’s head to wind by sail adjustment, while keeping little way on. A proven way of riding out a gale. Heaving Line ~ A light line, often with a Monkey's Fist tied in the end, for throwing ashore or to a man overboard. Helm ~ The steering mechanism. The tiller or wheel. The person steering (of either gender). Helmsman ~ The person steering a boat. 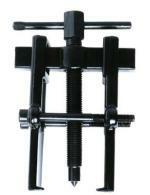 Highfield Lever ~ A tensioning device which can be rapidly disconnected. Hounds ~ The location on the mast at which the lower shrouds are attached. Hove-to ~ Lying nearly stationary in the water, usually with the foresail 'aback'.